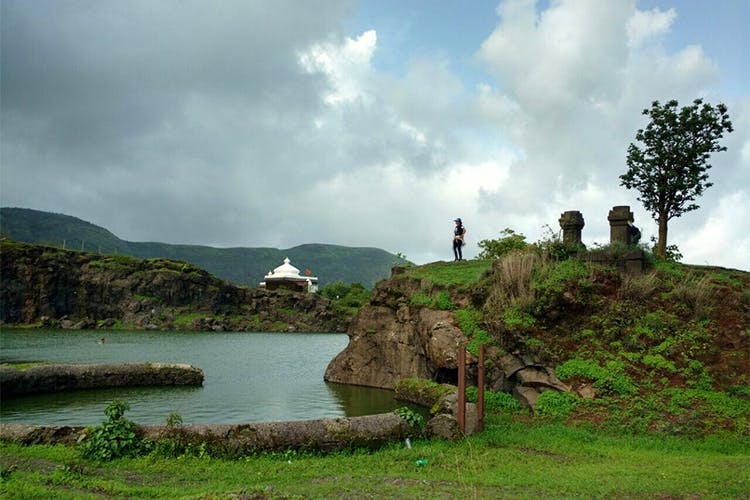 There’s an unexplored mountain right opposite Mulshi lake which will take you to beautiful monsoon-made ponds. This has been a trekker’s secret and we are letting it out. Dust your trekking shoes and go take a good old hike. Once you get to Mulshi, head on over to the Mulshi lake. Right opposite to the lake – head west side and take to the tiny waterfall. We’ve been told the area is the western part of Sahyadri hills. It seems to be an unexplored area, and is absolutely stunning. The route may seem vague, but follow us and you’ll thank us later. The road where the cars are parked near the lake, right opposite to that, is where this mountain stands. It’s a bit of a trek but totally worth it. You’ll spot a mini-waterfall alongside the road, climb that up and you’ll see tiny ponds that have cropped up during the monsoon. Jacuzzi-like, if you may, these ponds are a sight to photograph. Not just it, you can explore the area by walking around and you’ll find that the crowd from the lake won’t be here. Just you, nature and the rain that’ll splash your adventure-bitten bum. Make sure to carry waterproof clothes, shoes with a sturdy grip, and an umbrella may come handy too. With inputs from Kubra Chatriwala.